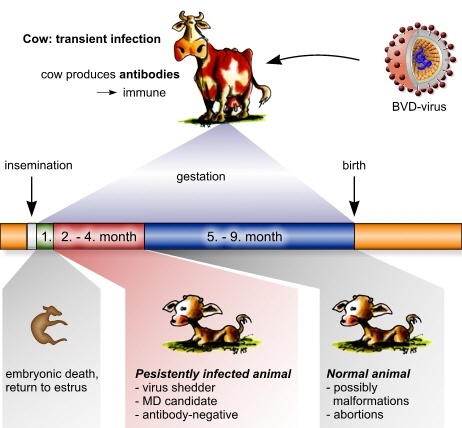 If an antibody naïve cow is confronted with the virus during pregnancy its foetus may be infected in utero. This event has different consequences, depending on the time of infection. In the first phase of gestation there is the possibility of resorption leading to reduced fertility. In the phase lasting from around day 40 to around day 120 infection with a cp virus causes abortion, whereas infection with an ncp virus results in a persistent infection of the fetus. In the majority of cases such foetuses are born normally and represent “candidates” for Mucosal Disease. Infection (with both cp and ncp virus) in the following period, i.e. until around day 160 of gestation, results in birth defects. The foetuses infected during that period are either aborted, weak, or there is stillbirth. Foetuses infected later develop neutralizing antibodies which can be detected by analysing the pre-colostral sera. These animals are born normally and are immune.